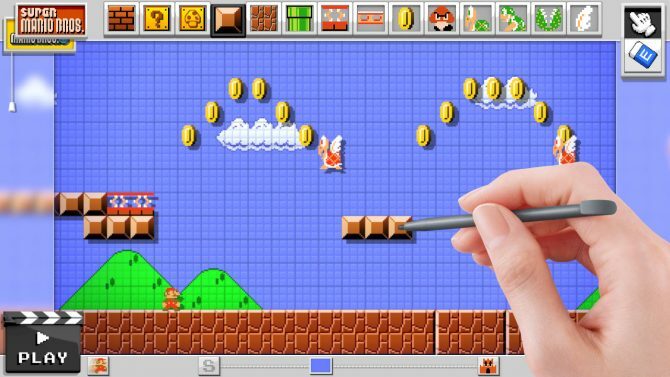 Games where players can create and design their own worlds have become very popular over the last few years. Though games like these existed before, titles like LittleBigPlanet and of course Minecraft have really made user created content explode in popularity. 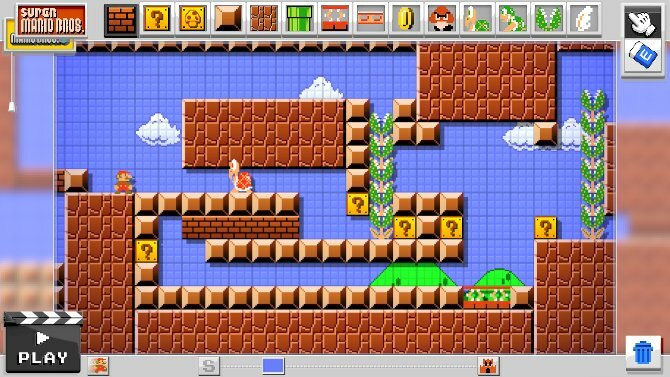 One of the things that you’ll notice from Minecraft and LBP is how much people love to create levels inspired by the original Super Mario Bros. This is natural given how many of us became gamers due to that title. 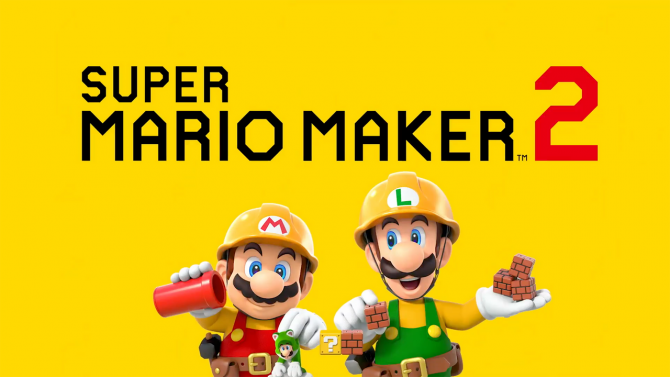 It’s fitting then that Nintendo would release a game that specifically allows us to create our own Super Mario Bros inspired levels. 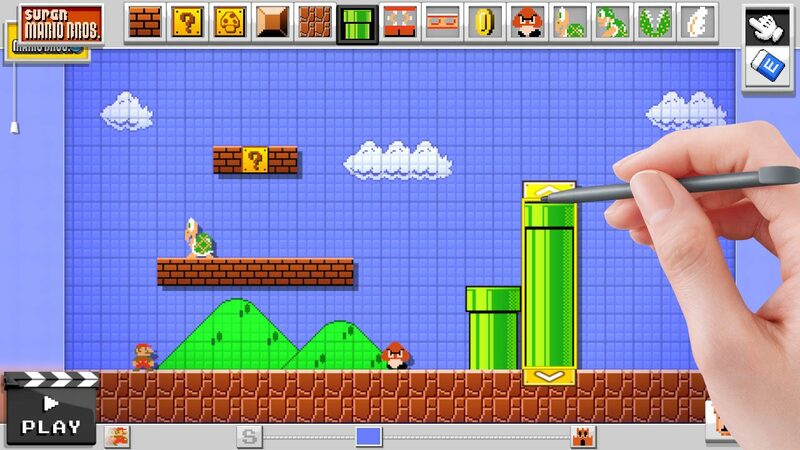 Mario Maker works a lot like the old-school Mario Paint on the SNES. You are given a set of objects that you can put on screen in any configuration that you want. You can edit the worlds as you see fit and even play test them before they’re finished to get a feel for how it plays. 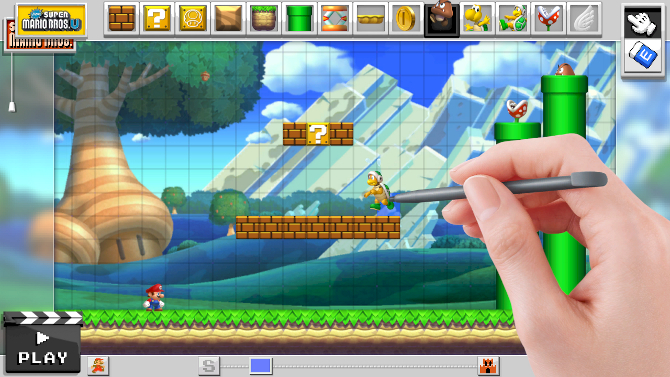 All of the editing is done via the Wii U controller’s screen with the stylus. This is definitely the best way to do this as it gives you precise control over where you want things placed. I got to try creating a level myself and was left to my own devices to figure out how. Thankfully, the game is very intuitive so it didn’t take me long to learn the ropes. If I had an idea of what I wanted to create then I know I could have conjured up something really cool given all that was available to me. I, however, just chose random objects and threw them on the screen with no real rhyme or reason. I ended up creating an unplayable mess but luckily there was a nifty dog icon which let me undo parts of the monstrosity I birthed. Getting used to the stylus was a bit tricky sometimes, especially when it came to moving around the world’s floor. Messing this up caused me to have to hit that dog icon many times. While my level wasn’t exactly well thought out, Ryan Meitzler created a really cool stage. He created one long floating platform that stretched from the beginning of the level all the way to the flagpole at the end. On top of the platform were as many of those Hammer Bros. as he could fit on it. He even put turtles on top of turtles just for the hell of it. Once he hit play, he ran as fast as he could while dodging the massive hammer barrage raining down on him (he somehow managed to clear the level in case you must know). 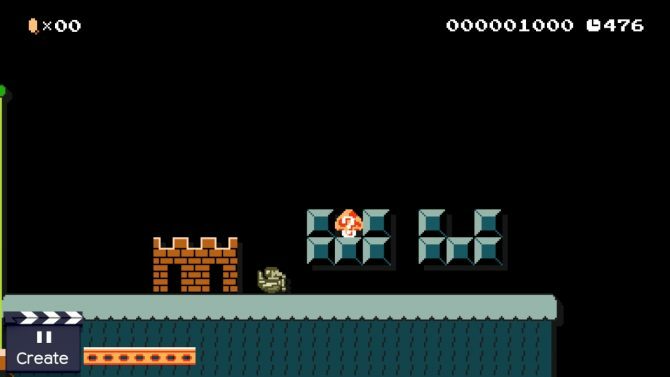 What’s really cool about this game is that you can switch the graphics between original Super Mario Bros. and New Super Mario Bros. The game works exactly the same with both filters on but I preferred the old-school graphics myself. What can I say, that’s the Mario that I grew up with so I have a special attachment to him. I asked if we would be able to share the levels with friends and have them play it but all I got in response was a “Stay tuned.” I hope that some sort of online functionality is added because I can see people creating really challenging and fun levels that they can then upload for others across the world to try out. If this game has some sort of share feature, it will become a complete package. 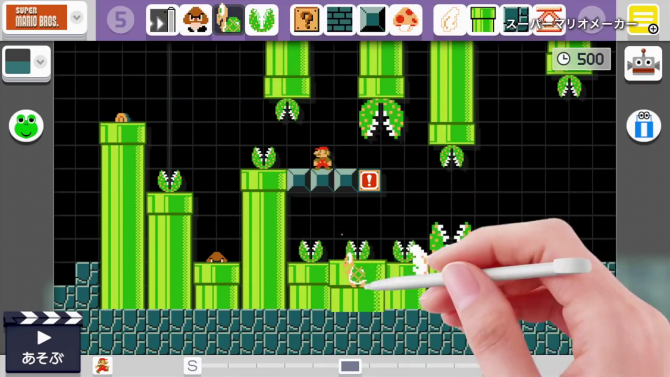 While Mario Maker may not technically be a game, it still is a lot of fun. The nostalgia in me was stoked hard while fiddling around the level editor and I can see people really getting into this title and creating all sorts of crazy levels. Let’s just hope we’ll be able to share them with the world.